I have a tendency to eagerly track construction of new bars, restaurants and shops. I follow them on Facebook, make vague, sort-of plans to drop in with friends, gobble up reviews in City Paper, and check all-too-regularly for any additions to its Yelp page. And then, nothing. The restaurant/bar/coffeeshop/boutique slowly fades from my memory or, more likely, is replaced by the next restaurant/bar/coffeeshop/boutique set to open in my ‘hood. Yeah, it’s not my best trait. So I’ve been trying to mix it up lately. Sure, I still have my regular haunts, but I’M WORKING ON IT, OK? BLUE MOON TOO. Blue Moon’s second shop opened a few months ago in Federal Hill, and I was lucky enough to get my Cap’n Crunch French Toast fix (topped with fruit and whipped cream) just before Jonas hit. So, so good and so incredibly sugary. The perfect comfort food for when you’re paranoid you’ll get snowed in without power and have to eat canned beans for a week. DAS BIER HAUS. The site of the now-closed Langermann’s on Light has been replaced with a German biergarten-style restaurant. We dropped in a few weeks ago for a beer (bier? ), and even though it had just opened, I was shocked by how packed it was. With communal tables and barely enough space to stand, you’d think I’d be complaining, but it actually kind of forced you to make friends. By the end of the night, I was sampling beer from some girls’ beer boot. You can judge whether or not that’s a good thing. BREW HOUSE NO. 16. A historic-firehouse-turned-neighborhood-brewpub. You know, just your average restaurant reno. K and I popped in a few weeks ago for after-dinner-drinks. I’d read that the food was just OK, so we opted to grab pizza across the street and then stop in for a nightcap. The decor was what really stood out to me here: tall ceilings, Edison bulbs hanging above the bar, fermentation tanks lining the wall behind the barstools and yes, even the old fireman’s pole. Next on my to-do list—and because I’m writing it here I will ACTUALLY have to go: 3 Bean Coffee next to Federal Hill Park, Iron Rooster in Canton (I’ve been to the Annapolis location which was amazeballs but I’m counting this), Diablo Doughnuts in Fells Point. Excited for: Blacksauce Kitchen to open a restaurant in Remington, Yard House to come to the Inner Harbor. My favorite restaurants are the places where I can try a little bit of everything and leave without feeling like I’m going to explode (always a good goal, right?). I love tapas and the recent trend toward small plates and so does my husband, Adam. That is why we were so excited for Adam’s birthday dinner at The Food Market in Hampden. IT DID NOT DISAPPOINT. Two things I like about Food Market right off the bat: free valet parking (the fastest way to win me over in a hard-to-park neighborhood) and the lively crowd. On a Friday night at 8pm, there was a great mix of young and old, families, couples and groups of friends. We started with drinks and since I’ve been on a gin kick lately, I tried the French Tease, a delightful, lemony cocktail with gin and bubbly. I sipped my cocktail alongside bread sticks and olive oil and our first course: duck confit potato skin and kale caesar salad. 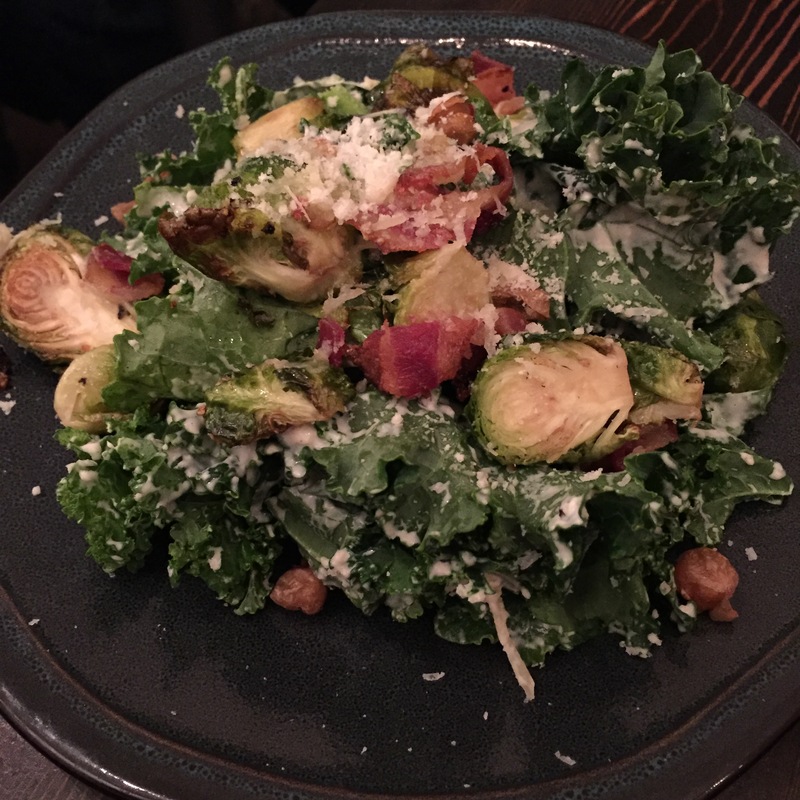 The salad was particularly good, chock full of yummy toppings like brussels sprouts, bacon and crispy chickpeas. The portion was also quite large and perfect for sharing. We had a long debate about our second course and whether or not we should double up on fried foods. I was interested in the street tacos and tuna meatballs but Adam wasn’t feeling them, he was interested in the pork belly but it was made with pecans and I’m allergic. 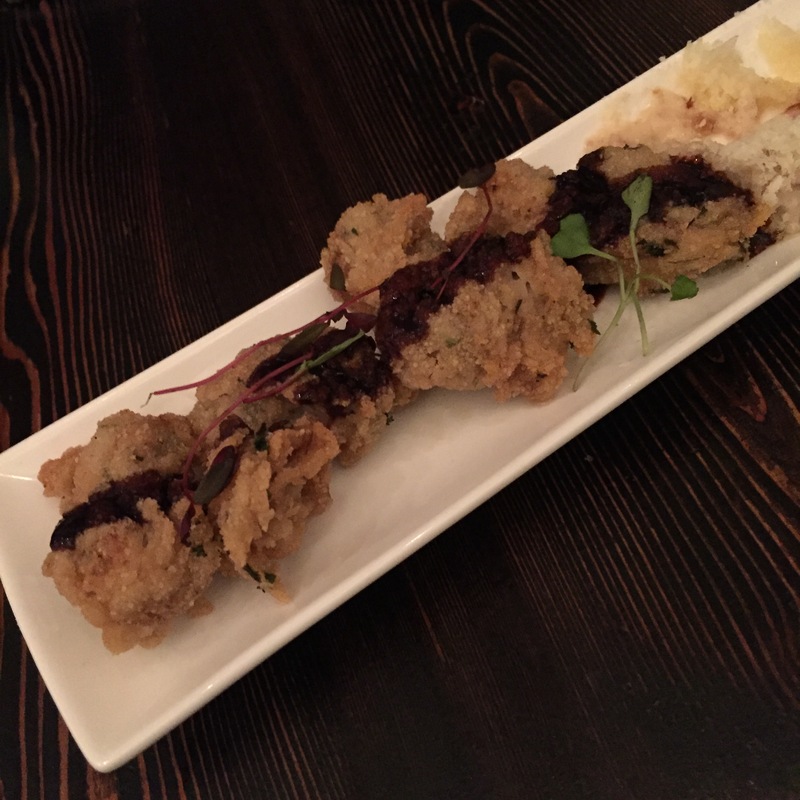 Ultimately, we decided we wanted the fried oysters and the tempura game hen and who cares if they’re both fried. I stand by our choice. The oysters were huge and delicious, perfectly paired with the bacon and onion dressing that accompanied them. 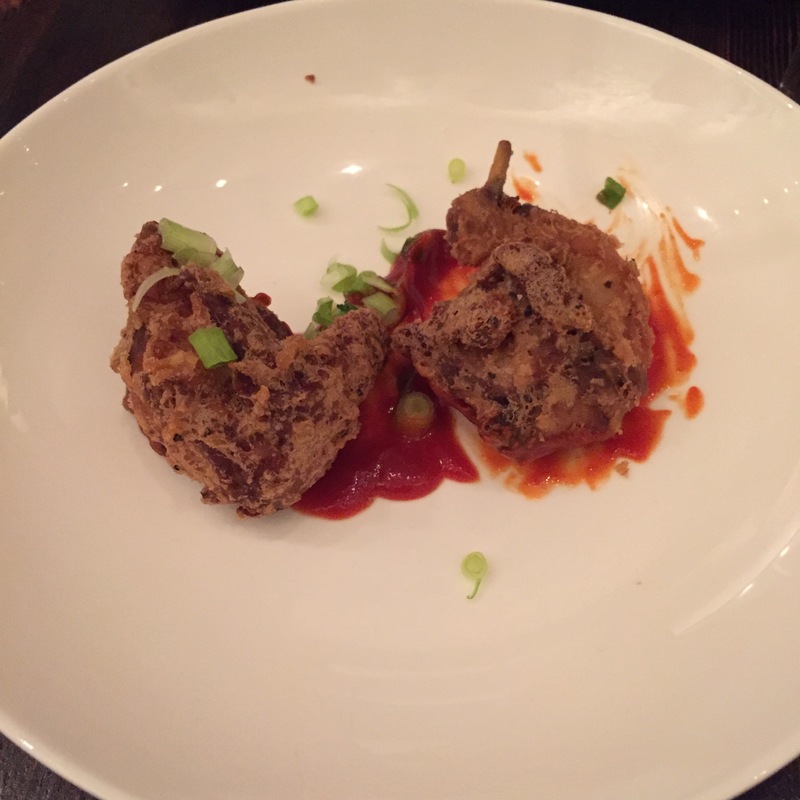 The game hen was good too, like an upscale Bon Chon, lightly fried and sitting in a sweet and sour Korean bbq sauce. The price for our first four dishes ranged from $6-$13 making it very affordable to try many different flavors. At this point in the meal, I was plenty full and could easily have stopped right there. But where’s the fun in that? This was a celebration after all. 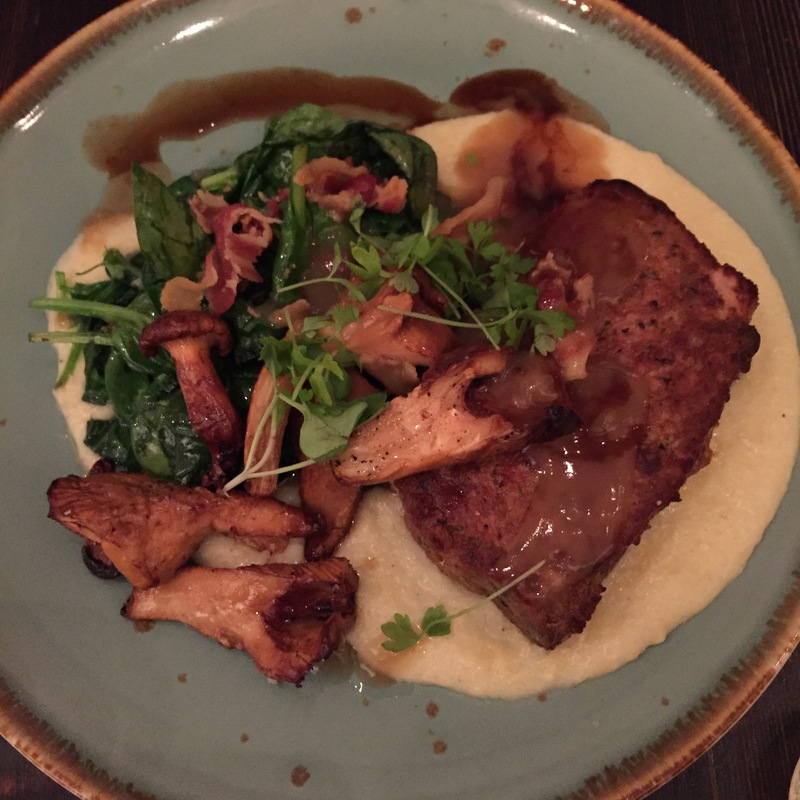 So I powered through, ordered a $6 glass of the house bubbles (served in the cutest stemless champagne flute, and tried the veal meatloaf with mushrooms, spinach and cheesy polenta. My goodness. It was so, so good. Up until this point the food had been good, but nothing really knocked it out of the park. 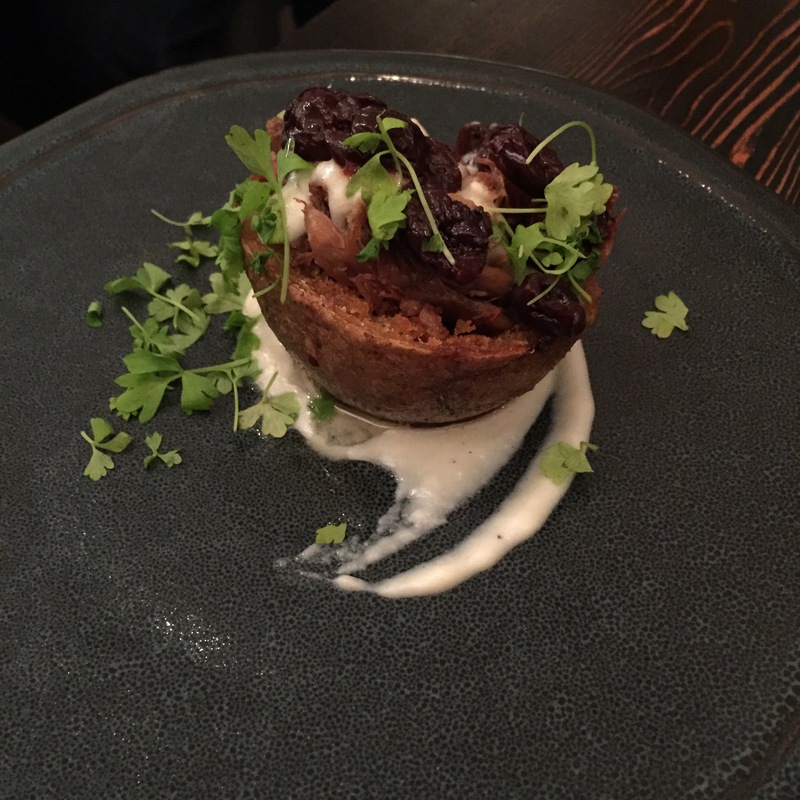 This dish, however, was out of this world! So there you have it, we tried five dishes on a long list of appealing sounding options (seriously, I could go back several times and find many more things to try). If you’ve looking for a lively restaurant that’s a lot of fun with an expansive menu and solidly good food – this is the place!